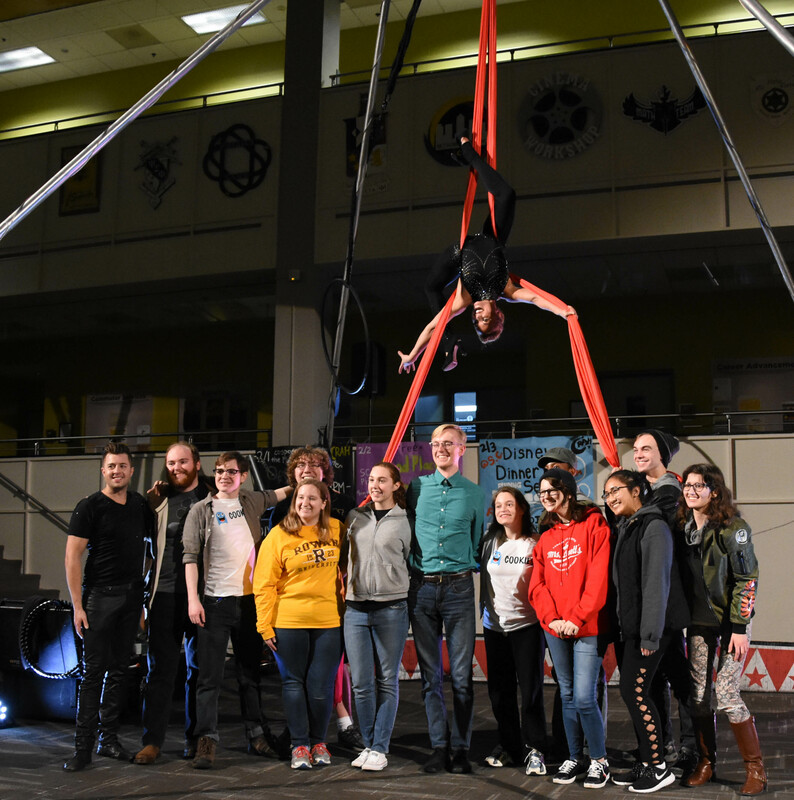 During the 10 Year Weekend Celebration of Rowan After Hours, Rowan students were treated to an awe-inspiring performance by The Great DuBois: Masters of Variety starring acclaimed showmen Michael DuBois and Viktoria Grimmy. Throughout the night attendees of the event were amazed by the duo’s acrobatic feats with several different acts showcased. In one instance, DuBois asked for two members of the audience to help him get up on a six-foot-tall unicycle while having a straitjacket on. “It was kind of crazy. I didn’t know if he was going to fall or not. I was definitely over supporting him. He did pretty good. 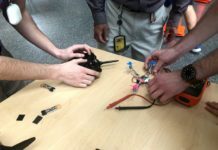 I was impressed,” said freshman electrical and computer engineering major Connor Quinn. Grimmy gracefully danced on hanging curtains and with a hula hoop. The crowd cheered as she did her part of the act. 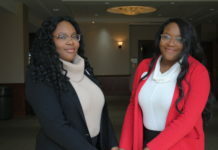 “She’s really stretching herself and working so hard, but she makes it look so flawless and easy,” said freshman early childhood education major Renee Handley. 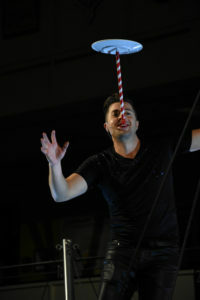 Other tricks the duo performed included juggling bowling ball pins back and forth while DuBois was standing with one foot on a slack rope and Grimmy was on the ground. Before DuBois got on the rope, he asked another student to help him onto the rope. “I was scared actually. 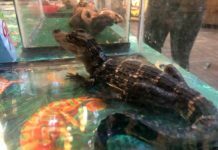 Mistakes happen, and I was just like, ‘Please tell me that I’m not going to do anything to mess it up,’” said junior English major Kaitlyn Trimble. 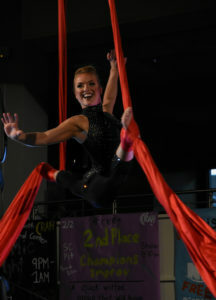 As for the performers, they had a great time showcasing what they do to Rowan students. “College students are great, and they’re like our favorite audience. We don’t have to be super cutesy for [them]. And they can understand the show, and they laugh. And we can kind of be ourselves,” DuBois said. When asked, they also commented on different projects they have worked on in their career and which they liked best. “Probably the most recent project we just worked on together, which was the Greatest Showman. It was staring Hugh Jackman and lots of other wonderful people. So it was really cool to work on something pretty high profile together,” Grimmy said. Previous articleWhat are your plans and predictions for the big game?